New LED alternative lamp source for existing HID fixtures. These bulbs pay for themselves in energy savings. 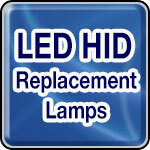 Manufacturers include GE, EIKO and SATCO - LED replacement Lamps for HID.